When Danny Ziemann, who teaches bass in SUNY Oswego's music department, could not find a book or other resources to supplement his lessons, he wrote one with the encouragement of his students. The resulting work, "The Low Down: A Guide to Creating Supportive Jazz Bass Lines," also features 50 audio files to complement instruction. OSWEGO — When SUNY Oswego bassist and bass instructor Danny Ziemann could not find the right text to help teach jazz bass lines, he decided to write one — “The Low Down: A Guide to Creating Supportive Jazz Bass Lines” — and include audio files supporting the lessons. When Danny Ziemann, who teaches bass in SUNY Oswego’s music department, could not find a book or other resources to supplement his lessons, he wrote one with the encouragement of his students. The resulting work, “The Low Down: A Guide to Creating Supportive Jazz Bass Lines,” also features 50 audio files to complement instruction. The 25-year-old has played bass for nearly 15 years, started giving lessons at 16 and, after graduating from the University of Rochester’s Eastman School of Music, began teaching at SUNY Oswego at 22. But as a musician whose groups include the Oswego Jazz Project, his appreciation and inspiration spans the decades that the instrument has kept time for jazz masters. In trying to find ways to best teach jazz bassline instructions, Ziemann tried, without success, to find a resource to supplement his lessons. “I had been writing out formulas and exercises on scrap sheets of paper and must have done it at least 50 times,” he said. As a bonus, Ziemann includes 50 audio files to accompany lessons to provide “an aural demonstration of what I’m talking about,” he said. The text and audio supplements will help Ziemann and other teachers and students, and his work has received acclaim. 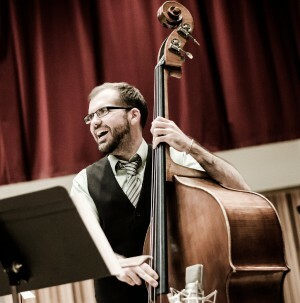 And while Ziemann’s playing talents are recognized — recently winning second prize in the jazz division of the International Society of Bassists double bass performance competition in Colorado — he sees “The Low Down” as an opportunity to help bassists and anybody looking for insight into jazz bass, where “the level of experience doesn’t matter,” he explained. For more information, to order the book or to check out the audio files, visit http://www.dannyziemann.com/the-low-down.html.